On this page, you can read some background information about the Birmingham Cross-City South project, see photos of the real line, view screenshots, learn of it's history, find out how to drive the simulated route, and read information about the real-life line. You can follow progress with the project as it's being developed, via the Railsimroutes.net Blog. The Birmingham Cross-City line, of which the southern section is modelled here, runs from the new town of Redditch in the county of Worcestershire, to the busy New Street station in the heart of Birmingham, the UK's second city, and onwards to Lichfield Trent Valley in the county of Staffordshire. Here, the line crosses over the West Coast Main Line. Since 1995, the Cross-City line has been exclusively operated by the Hunslet TPL class 323 25kV AC overhead electric multiple unit, notable for it's quick acceleration, three-phase traction equipment and distinctive traction motor sounds, not unlike VVVF (Variable Voltage, Variable Frequency) equipped Japanese EMUs. Electrification of the Cross-City Line with the UK's MkIII 25kV AC overhead system began in 1991, and the route was energised in 1993. Initially, electric services were operated by ageing class 304, 308 and 310 EMUs, as the then new class 323s weren't ready en-mass until 1994-1995. Prior to electrification, the route was operated by old class 108, 115, 116, 117, 118 and 121 diesel multiple units, since 1978, when the Cross-City service began. 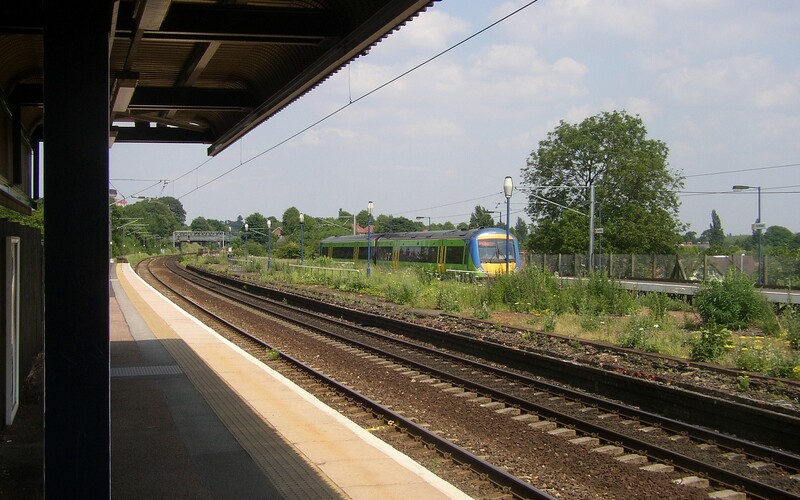 The route itself existed long before this however, with the Redditch to Barnt Green branch having been previously built by the Midland Railway in the 1850s, and with stations being opened between Barnt Green, Birmingham and Lichfield between 1840 and 1882. For more information, you might like to visit http://en.wikipedia.org/wiki/Cross-City_Line. If you are interested in knowing what hardware and software has been used in the development of this project, both currently and in the past, please see my PC Specs page. To find out more about this route project for openBVE, please click here. To download this route (when it's available), please visit the Birmingham Cross-City South downloads page. 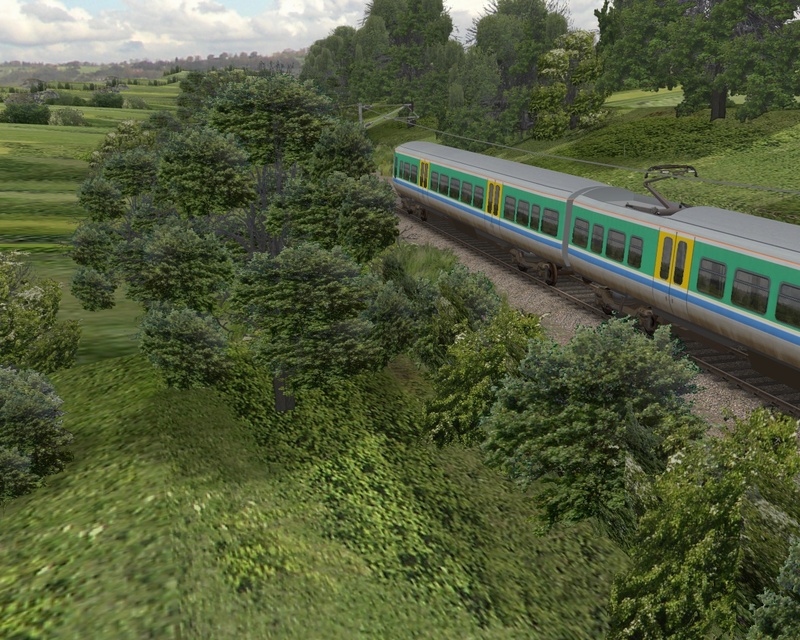 The class 323 and 3D cab are available now, however. The Birmingham Cross-City South Route project was first released in May 2002 (the release announcement is still available via the news archive). The route was an add-on for version 2 of mackoy's BVE Trainsim. The decision to develop the Cross-City South followed on from the success of my first BVE route, Watford Junction to Milton Keynes Central. 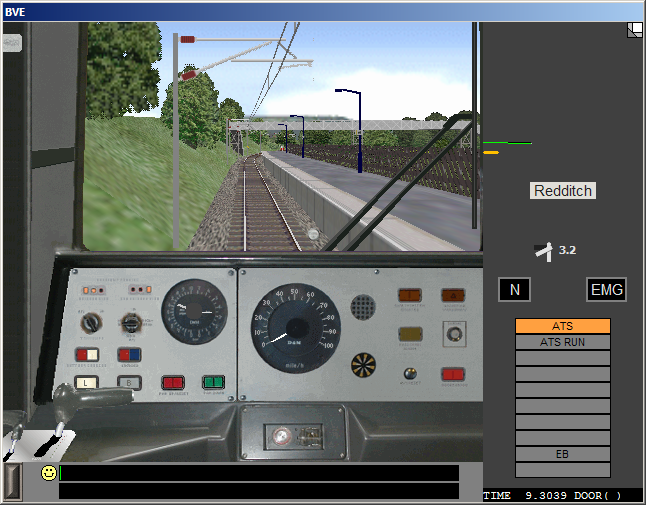 Cross-City South v1.0 was designed for BVE 2's limited resolution (the cab panel was 480x440 pixels, but the 3D viewport was only 480x240 pixels. 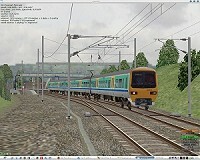 A class 323 EMU was also developed, and this was a joint project between myself and Steve Green of trainsimcentral.co.uk. Both the route and train were a success, and became popular with UK BVE users. 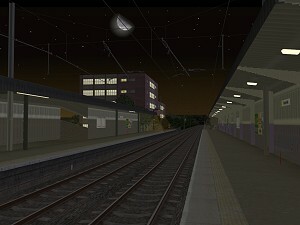 In June 2003, the route was updated to version 1.2 for BVE version 2.5 (still with the same limited resolution), and included new authentic track and flange sounds, and semi-functional AWS. New Autumn routes and updated Winter routes were inlcuded, with superb tree textures by Simon Gathercole, and the Autumn and Summer routes included a new rain option. Poor rail conditions caused by snow and rain were also far more realistic thanks to new 323 wheel slip effects. A revamped class 323 cab and passenger view package increased realism considerably with it's new sounds and day/night time graphics. 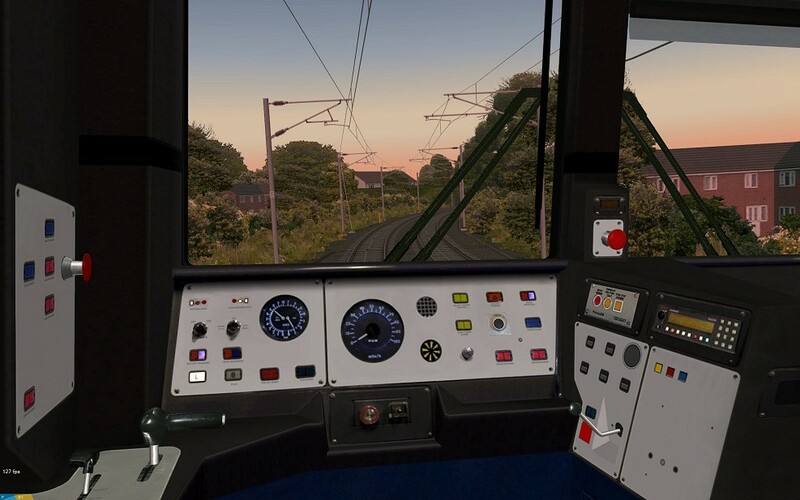 New photo-realistic skies including new dawn/sunset routes for use with the new 323 night-lit panel were also included. New track objects and textures were developed, and scenery textures were enhanced. Additional signs, foot crossings and updated buildings were also included, and I developed an "alpha bridge shadow" technique which was applied to overbridges along the route. I also introduced the idea of "High Detail XP" routes, which were designed to run in BVE 2.5 under the Windows XP or 2000 operating systems only, due to some curious limitations of BVE 2's performance and rendering fluidity under Windows 9x. These new high detail routes took advantage of BVE 2.5's relaxation of limitations on the numbers of objects which could be added to routes, and combined with BVE 2's oddly smoother performance under Windows XP/2000, allowed new features like additional buildings, extra scenery, custom built pointwork designed to fit the unique track geometry of the Cross-City South, and the most sophisticated catenary system in any UK BVE route at the time of release. 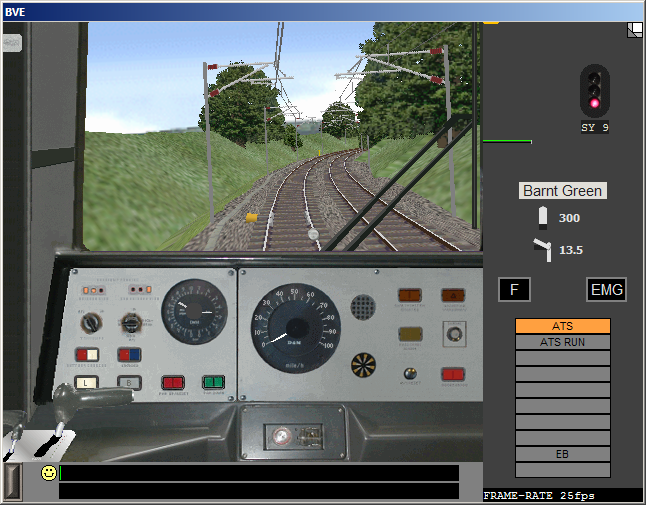 In September 2005, I updated the route again to version 1.3, as BVE Trainsim version 4.2 had been released some time earlier. This version of BVE had a maximum resolution of 1024x768 pixels, and unlike BVE 2, the 3D viewport filled the entire screen. 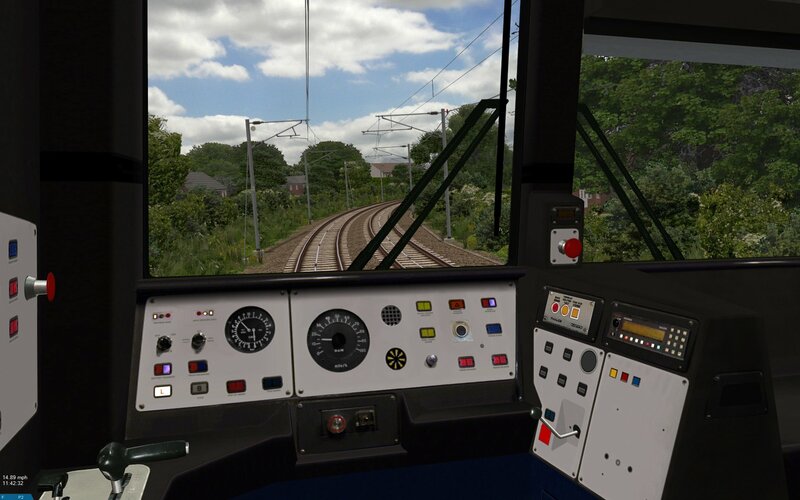 Cross-City South v1.3 included a new Spring seasonal variation, and for the class 323, I provided some new, higher quality track and flange sound recordings from the real Cross-City line and class 323. BVE 4 enabled the use of plugin DLLs for the simulation of train safety systems, and Simon Gathercole developed a plugin enabling full AWS, TPWS, DRA, driver vigilance, door interlock and pantograph up/down simulation, and Steve Green also worked on a 1024x768 photo-realistic panel for the 323, together with Steve Thomas, using high resolution photos which he supplied. New dawn, sunset and night routes using time of day effects were also introduced, facilitated by BVE 4's implementation of directional and ambient lighting. Many objects were also converted to the DirectX object format after Simon and I experimented with it's emissive colour properties, which could be used to create glowing lamps, street lights and headlights. An experimental night route I developed, demonstrated that all of these lighting effects revealed some sadly unrealised potential however, because cabs in BVE 4 couldn't be illuminated independently of the ambient lighting conditions, which meant black fog still had to be used to simulate night time, which also obscured lights in the distance, spoiling the effect and realism. Unfortunately, this enhancement to BVE 4's cab lighting never happened, despite being suggested. Cross-City South version 1.3 also saw the introduction of photo-realistic MkI and MkIII catenary, which was a result of work I'd done on the Watford Junction to Rugby project. Rain and thunder were also added to increase the atmosphere of the route, more photo-realistic textures were used, as well as smoothly curved platforms added. Signalling was also randomised as much as possible without compromising authenticity. In mid 2008, after having effectively left the BVE community three years earlier because BVE 4 was no longer enabling me to realise my route building dreams, and also because the program was no longer being updated at this time, I became aware of the openBVE project, an open source alternative to BVE Trainsim. Straight away I saw the potential in the new platform and the remarkable gifts of openBVE's developer, and it's thanks to Michelle and openBVE, that Cross-City South has evolved into something far more than I ever expected it to become. In July 2008, I started by merely fixing various coding errors which were revealed because openBVE's parsers were far more rigorous and helpful than BVE Trainsim's, and by adding some basic exterior car objects (see left). In the months which followed however, I experimented with many of the new features and capabilities which openBVE offered, and animated the scenery, made cables swing in the wind, autumn leaves fall from the swaying trees, bushes appear to react to the turbulence caused by passing trains, moving point blades and mechanisms, flying birds and butterflies flitting across the vegetation, and more. Highly detailed exterior car obejcts were developed, with faked window reflections and parallax scrolling scenery effects, an animated pantograph, and so-on. openBVE also resolved the issues with regard to emissive lighting, without having to resort to using Microsoft's DirectX object format, allowing for the cab to illuminated independently of the environment, and enabling true depiction of night-time. When 3D cabs became possible, the in-cab simulation was transformed, especially with the openBVE driver's head model simulating the effects of inertia and acceleration forces on the body. The end results of all this are what you see today in the screenshot gallery above, on my YouTube channel, and in my blog. The final image below, shows just how far both the Cross-City South and class 323 projects, and free-of-charge train simulation, has evolved over time, and what can be looked forward to with the release of Cross-City South v2.0.